Fly to Luxor with the domestic flight service of Egypt Air. Embarkation before lunch. Visit the stunning Temple of Karnak, and the Temple of Luxor. Optional Excursion to Sound & Light Show at Karnak Temple. After breakfast leave by coach to visit the West Bank, including two or three tombs in the Valley of the Kings and at least two more in the Valley of the Queens. Continue to the Temple of Hatshepsut and the Colossi of Memnon. Set sail for Edfu. Dinner on board. After breakfast visit the Temple of Horus in Edfu. Lunch on board. Afternoon tea and sail to the Temple of Kom Ombo shared by the gods Haroeris and the crocodile deity Sobek. Continue to Aswan, Egypt’s southernmost city. After breakfast visit the Aswan High Dam, the ancient granite quarries and the Unfinished Obelisk before continuing to the Island of Philae, with its Temple of Isis. Sail on the Nile in a traditional felucca around Kitchener’s Island. Breakfast followed by disembarkation and transfer to M.S. Eugenie. Visit to Kalabsha temple, dedicated to Mandoulis, the Nubian version of the god Horus. Continue to the rockcut temple of Beit El Wali, and the kiosk of Kertassi erected in honour of Isis. Sail to Wadi El Seboua, the Valley of the Lionesses, named after the avenue of Sphinxes, and drink cocktails on board while passing through the Tropic of Cancer. Visit to Wadi El Seboua temple, the temple of Dakka and the temple of Meharakka. Breakfast followed by morning visit to the temple of Amada and the rock-cut temple of Derr as well as the tomb of Penout, Viceroy of Nubia under Ramses VI. Sail to Kasr Ibrim to view the citadel of Kasr Ibrim, the only monument on Lake Nasser to remain in its original location. (Tour is conducted from the ship's sundeck as entrance to the site is not permitted). 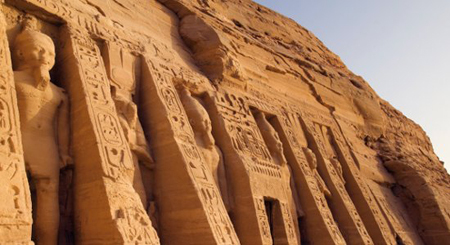 Visit the Abu Simbel temples of Ramses II and his wife Nefertari. Optional excursion to the Sound & Light show at Abu Simbel. Candlelight dinner on board and overnight. Breakfast on board before disembarkation and return with Egypt Air domestic flight to Cairo. 2 nights in Mercure Le Sphinx in Cairo on B&B basis; 4 nights Nile Cruise on board M.S. Nile Premium; 3 nights cruise of Lake Nasser staying on M.S. The Eugenie based on full board including, breakfast, lunch, dinner and afternoon tea. Scheduled flights with Egypt Air from UK to Luxor (with stopover in Cairo) and from Abu Simbel back to UK (with stopover in Cairo); private transfers in air-conditioned car from airports in Egypt to accommodation. Excursions as detailed above, accompanied by a fully qualified English-speaking Egyptologist. Optional full day excursion in Cairo available from £65 per person.